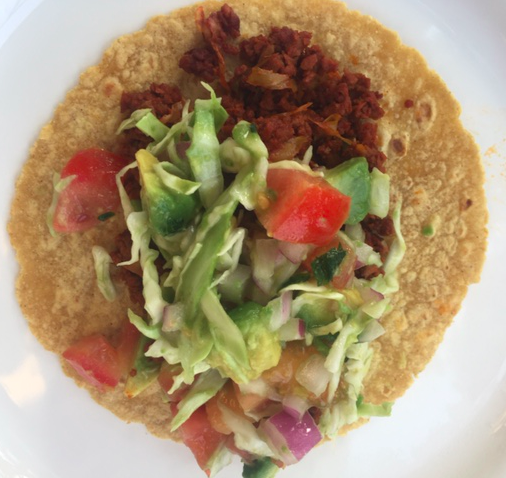 These delicious and planet-friendly tacos have a carbon footprint of 121 g CO2-equivalents per taco, compared to 277 and 818 g CO2-equivalents per taco for tacos made with chorizo and beef, respectively. A close friend and great chef, Alma Rafael, recently had us over for a relaxing summer dinner. These tacos totally hit the spot! She had fried up a large pan of Soyrizo, and while we were talking she threw together a simple, perfect salad of fresh cabbage, tomato, red onion, avocado, lemon, and salt. No need to even measure anything! She then heated up tortillas on a dry, hot pan, and everyone went to town. Soyrizo is a very flavorful meat alternative, although this recipe would also work with refried beans. Using beans actually results in the lowest carbon footprint (see below for details). Heat up the Soyrizo according to the package. Mix the veggies in a bowl and add lemon and salt to taste. Heat tortillas on a dry skillet on medium high heat, flipping before they brown too much. Put it all together, add hot sauce if you’d like, and enjoy! This recipe has just 121 g CO2-equivalents per taco! 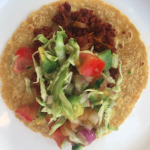 Accounting for all ingredients, a taco with pork chorizo has 277 g CO2-equivalents per taco, more than double that for the Soyrizo version! Now let’s check out the impact of beef in place of the Soyrizo in this recipe. Remember cattle are ruminant animals, and thus produce methane as part of their natural metabolism. If you used 1 oz. of beef in each taco, rather than the 1 oz. of Soyrizo, the footprint for the beef alone would be approximately 741 g CO2-equivalents per taco, leading to a total of 818 g CO2-equivalents per taco for a beef taco. Using cheese rather than any meat or Soyrizo results in a total of 352 g CO2-equivalents per taco. Cheese has a heavy carbon footprint because it is a product from a ruminant animal. The absolute lowest footprint comes from using beans rather than the Soyrizo! The beans have a very low conversion factor for g CO2-equivalents per g food, resulting in a total footprint of 100 g CO2-equivalents per taco!! Using Soyrizo instead of beef saves the emissions in 25 miles of driving a 40 MPG car! If you made this switch every week for a year, that would save the equivalent of 1,300 miles in the same car! With Alma (she is on the left) on our taco night! Thank you, Alma! Please follow the blog for more recipes! 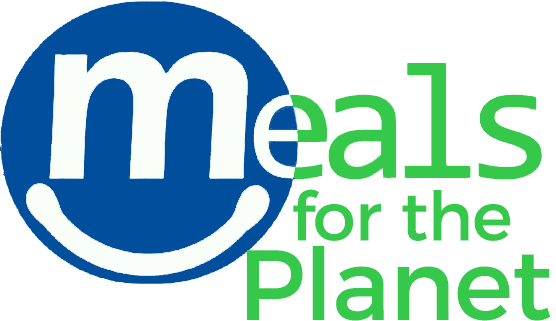 You can post your creations to the Facebook page, or use the hashtag #easymealsfortheplanet on Instagram, so we can see what you are up to! Happy eating! Nijdam, D., Rood, T., and Westhoek, H. (2012) The price of protein: Review of land use and carbon footprints from life cycle assessments of animal food products and their substitutes. Food Policy, 37:760-770.